Astaire and Rodgers, Sonny and Cher, Bogey and Bacall, some couples are so great together, you just can’t picture one without the other. 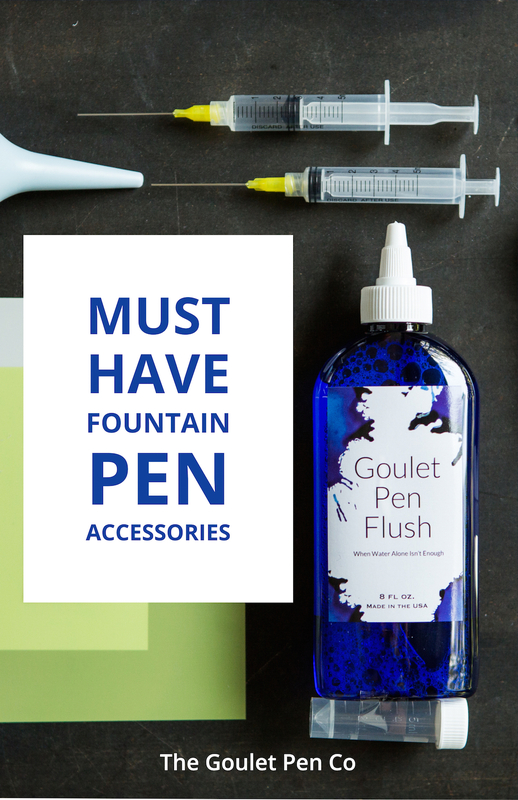 We’ve paired up 6 pens and inks so perfect for each other, they’re giving us all the #RelationshipGoals. Some couples just sparkle and radiate love everywhere they go. 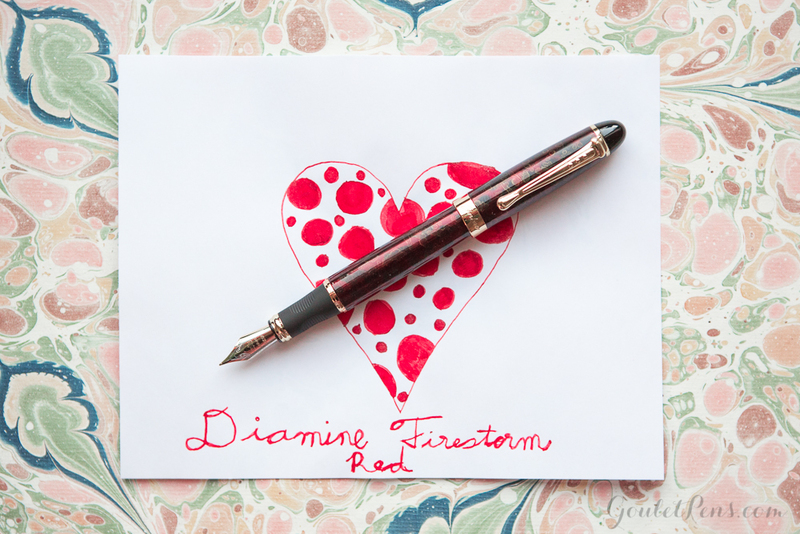 Diamine Firestorm Red (2ml sample- $1.75, 50ml bottle- $20), a recent addition to the Shimmertastic line of inks, is perfectly represented by the juicy wet medium nib of the Jinhao X450 ($9.90). 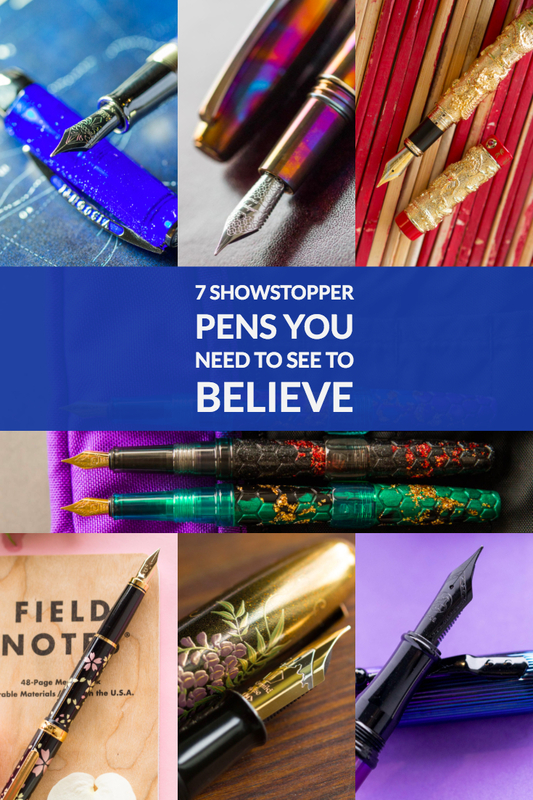 The deep red of the pen body rivals the deep love you will develop for this gloriously glittering ink. This delightful duo is perfect for a festive change in your everyday carry or a bold and brazen choice to pen a love letter. For the more reserved, classic romantic, there are these marvelous mates that appear to be made for each other. 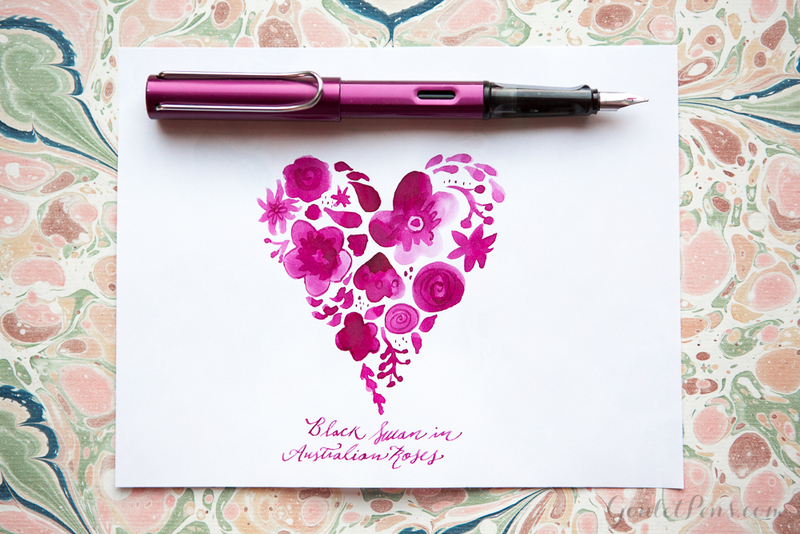 Can you believe how well the delicious purple Lamy Al-Star ($37.60) coordinates with Noodler’s Black Swan in Australian Roses (2ml sample- $1.25, 3oz bottle- $12.50)? It was definitely love at first sight for us! 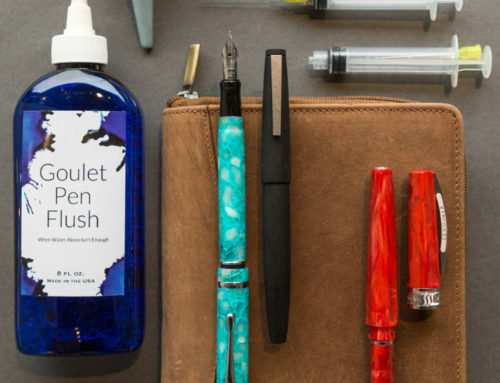 This workhorse pen and dearly beloved ink are a match made in heaven and pair perfectly together for writing a love letter, a list of supplies for the perfect Valentine’s Day, or even just a pleasing note-taking choice. This dark and mysterious pairing is packed full of intrigue. The luscious music nib of the Neponset ($75) allows Red Dragon (2ml sample-$1.25, 30ml bottle- $7.50, 80ml bottle- $14.95) to really show off its deepest red potential. 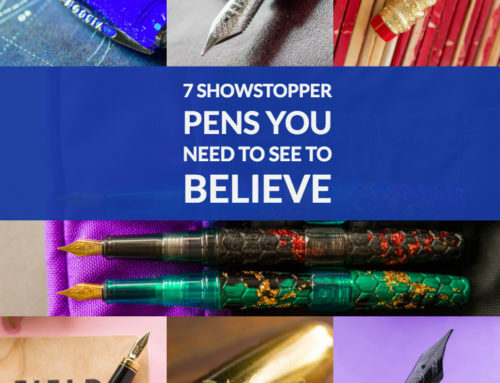 As Madigan pointed out in her ink review, this Diamine hue also possesses penchant for changing hues based on paper choice, giving this combination the upper hand in the element of surprise. 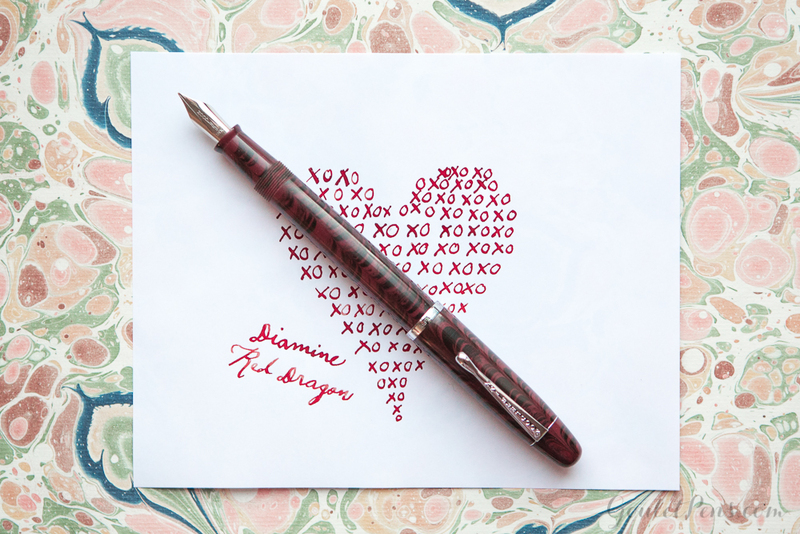 Snag this rich pen and ink for a creative adventure in flex pen fun and gorgeous Valentine’s inspired crafting. Wholesome and sweet, pink is the color of innocence and ease. 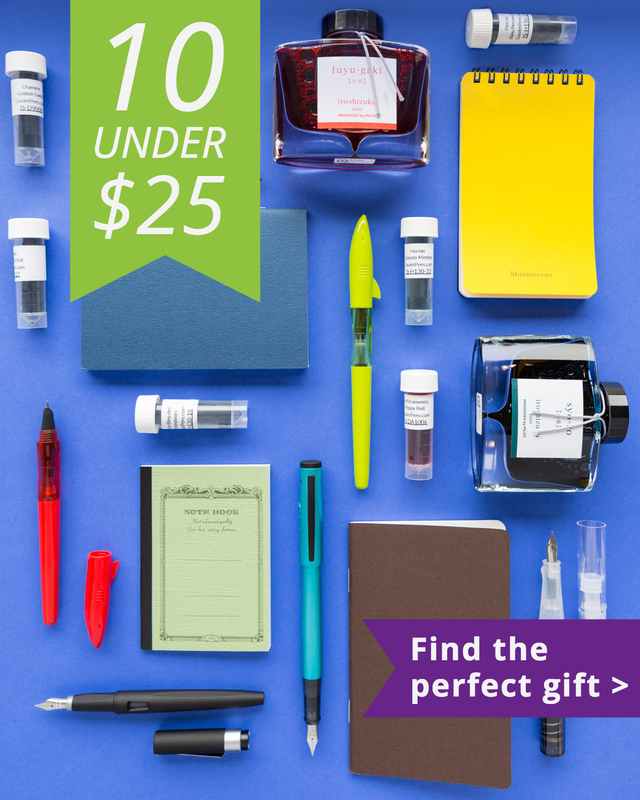 The Pilot Kakuno ($13.50) is the perfect pen for all ages. 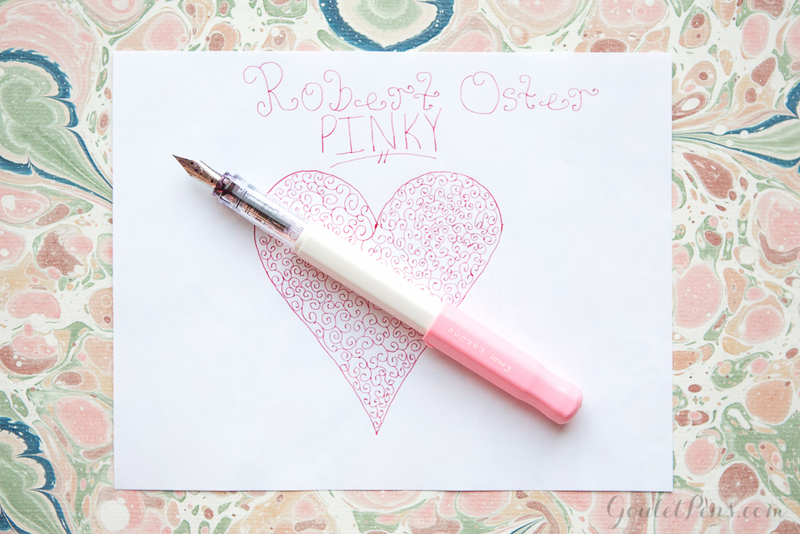 Robert Oster Pinky (2ml sample- $1.50, 50ml bottle- $16) coordinates perfectly with it. 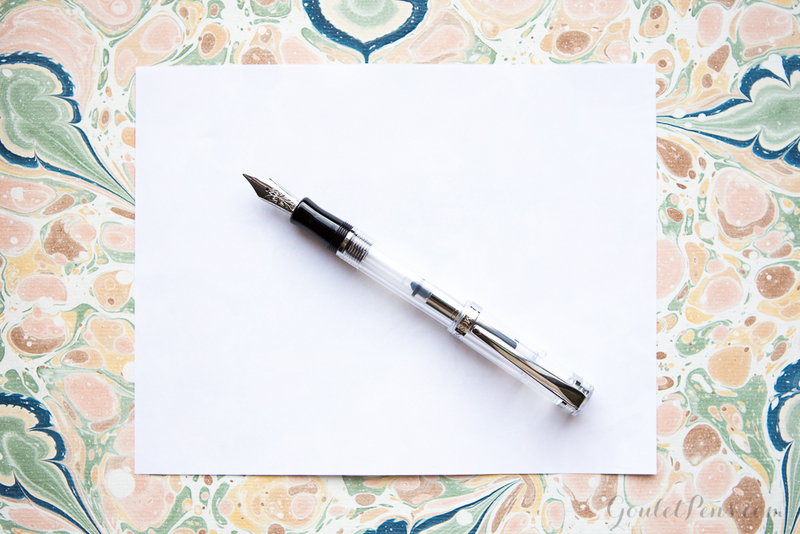 Whether used by a child writing valentines for classmates or an adult penning a simply sweet note of gratitude to a dear friend, this pen and ink pairing works for everyone. 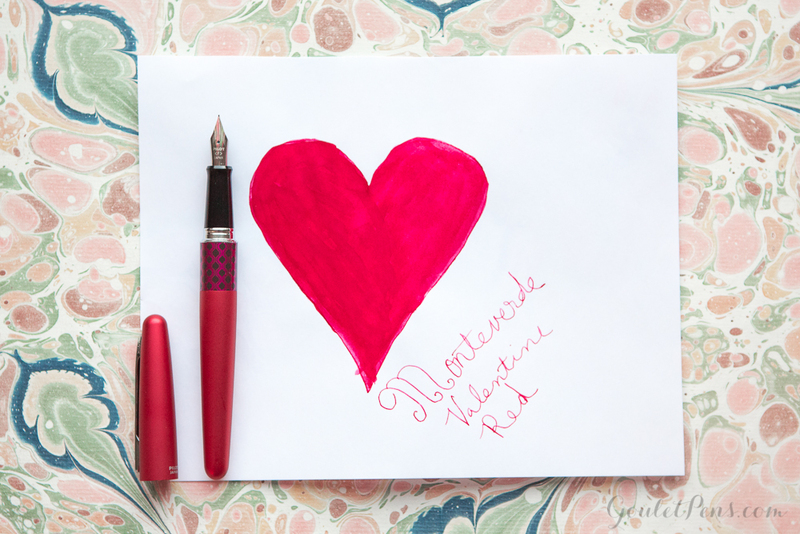 What is a list of Valentine’s Day writing tools without an ink called Valentine Red? 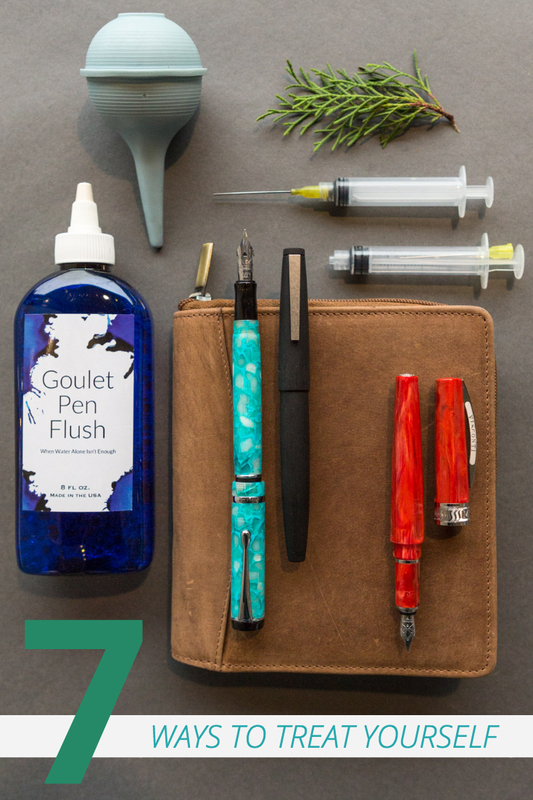 The Pilot Metropolitan ($15) is a favorite pen of even the most seasoned fountain pen users. 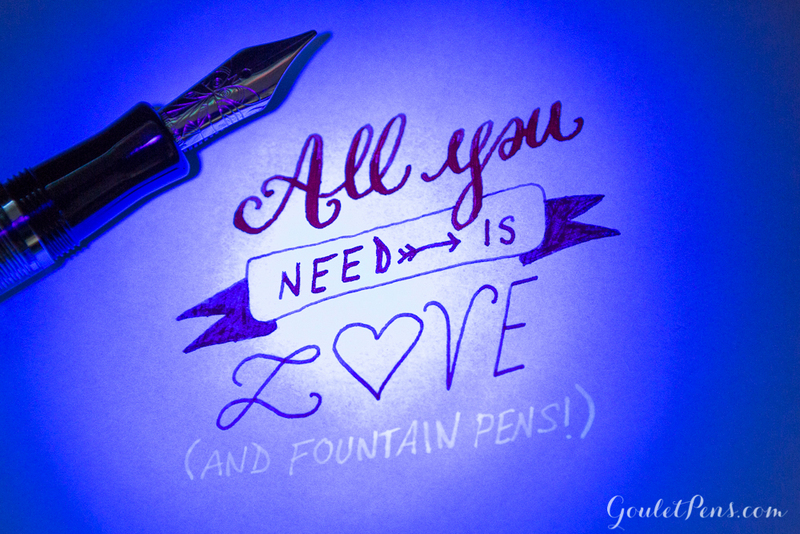 Universally loved and adored, this pen is the perfect mate to an ink meant to convey the color of love and adoration. Valentine Red (2ml sample- $1.25, 90ml bottle- $15) is rich and eye catching, perfect for signing those valentine cards and expressing the sentiments of the holiday. Sharing a message meant for a one set of eyes only? 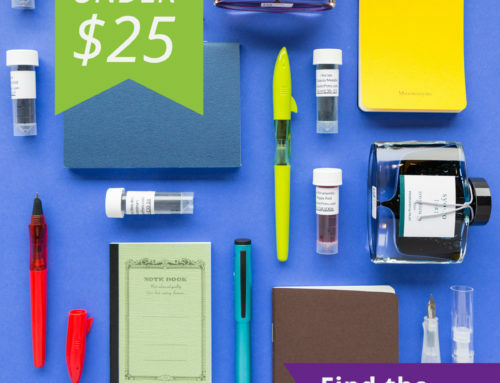 Noodler’s Blue Ghost (2ml sample- $1.25, 3oz bottle- $13.50, 4.5oz bottle- $18) will keep your secrets safe until they’re ready to be read. 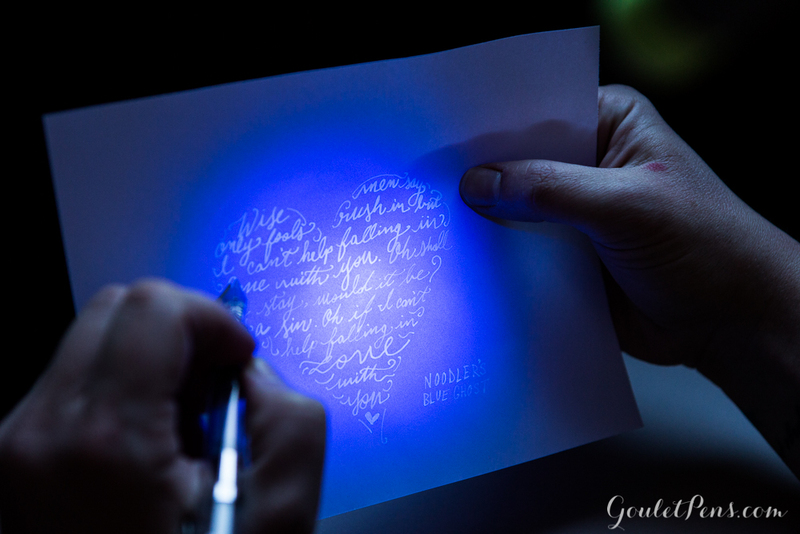 This invisible ink only shows up under UV blacklight. 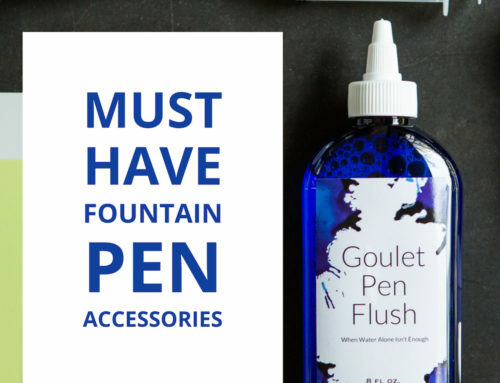 Paired with the clear Nemosine Singularity demonstrator ($19.99), this pen and ink are perfect for the secret love birds that want to keep things hush hush. The most important thing to remember this Valentine’s Day is that no matter who you’re writing to, don’t forget to write! 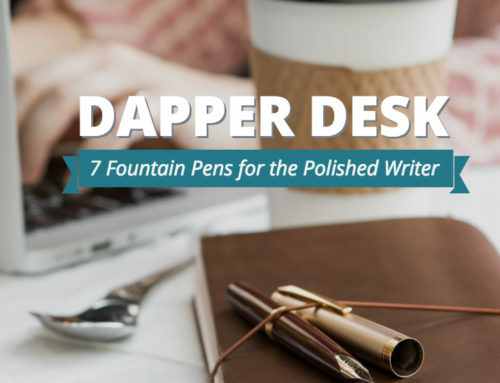 Writing a letter, note, or entire novel to express your love and appreciation is a great way to make sure your sentiments live on forever and remain cherished. 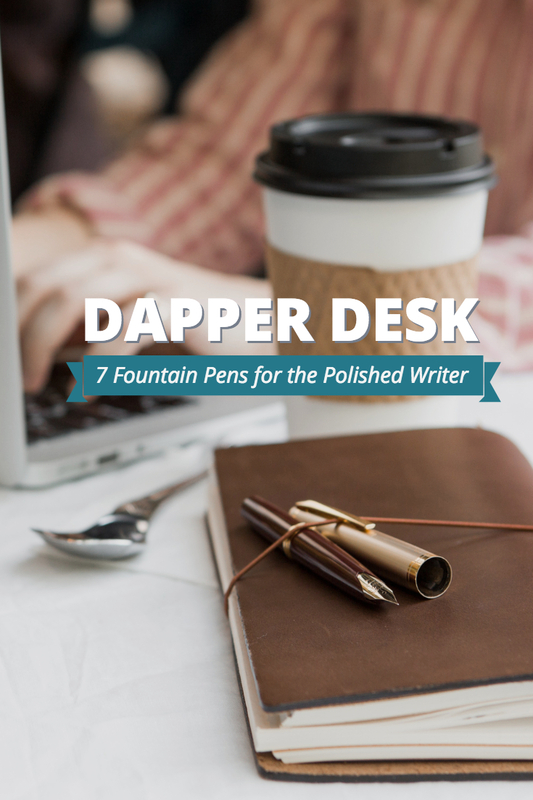 Hopefully, these great pairings have inspired a spark within you to write it all out! You can find them all in our special Valentine’s Day themed shopping guide. 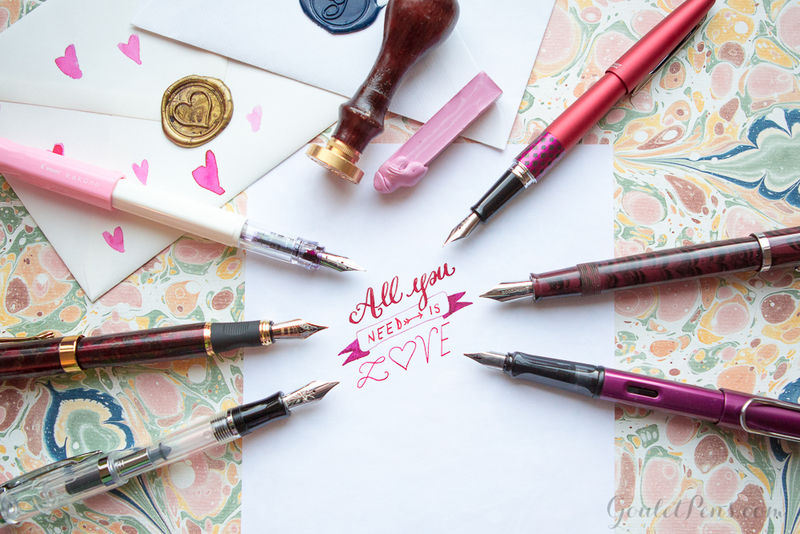 What is your go-to Valentine’s pen and ink pairing? 7 Ways to Treat Yourself!